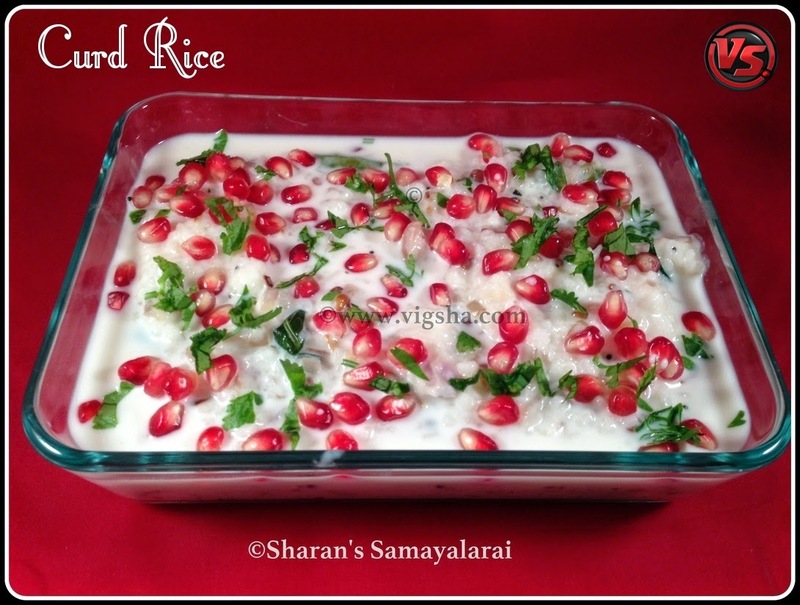 Bangala Bath | Curd Rice | Thayir Sadham is very simple and a comforting dish, which is almost popular among every house hold. This is loved by all, irrespective of ages. A perfect south Indian meal will never end up without this simple curd rice. Taste and flavor of this rice can be altered by combining veggies, fruits and spices. You can keep it simple without the seasoning. On special occasions, top it with raisins, cashews, pomegranate pearls & carrot. Curd has innumerable health benefits. Click this link to know how to prepare thick homemade curd(yogurt) along with tips. 1). Pressure cook the rice by adding 2½ cups of water. Leave it for more whistles so that the rice is mash cooked. When done, mash the rice nicely with the back of the spoon and keep it aside. Add the required salt immediately, this avoids the rice forming lumps when cooled down. 2). Heat oil in a pan, add mustard and let splutter. Add chopped ginger, green chilli, hing and curry leaves saute for a minute and switch off. Keep aside. 3). Add warm milk to the mashed rice and mix well. Add fresh cream or butter or sour cream at this stage and mix well until it becomes creamy. Mash it nicely and mix it up nicely with the rice. When it is completely cool, add the yogurt to this and mix it up smoothly without any lumps. 4). Add the sauteed items to the rice yogurt mixture and mix well. Make sure the rice mixture is in little loose consistency. Taste and adjust the salt at this stage. 5). Before serving, garnish with seedless grapes or pomegranates or finely chopped raw mangoes. Serve it with any pickle of your choice. # Never add curd to the hot rice, it will leave water. # I prefer to add, full cream milk to the rice as it gives a creamy texture. # Add lot of milk and little curd, if you are planning to serve after 5 hours(esp during traveling). But if you are serving immediately then add more curd and little milk. # Green chillies help to avoid the rice becoming too tangy. # Never use your hand for mixing if u make the curd rice in advance. It will become too sour. # Garnish the rice with fruits (seedless grapes, pomegranate), veggies (carrots, cucumber) and nuts (cashews & raisins) only before serving as it will change the color of the curd rice. # Adding mor milagai while tempering adds more flavor to the rice. # The curd rice becomes thick as time passes. In that case you can add more curd or milk and adjust accordingly.